Line-crossing ceremonies are long-standing initiation rituals in navies (and for all mariners) the when sailors first cross the equator. These ceremonies go back at least 400 years and are still performed all over the world. Specific traditions vary, but certain basic rites tend to be standard. Sailors are divided into two groups: the initiated, called Shellbacks or Sons/Daughters of Neptune, and the uninitiated, called Pollywogs, or Wogs for short. In the days leading up to the day of initiation, Pollywog Day, Shellbacks taunt the Wogs. On the eve of Pollywog Day, the Wogs stage a mock mutiny. In response, the Wogs are called before the royal court to answer for their mutiny. 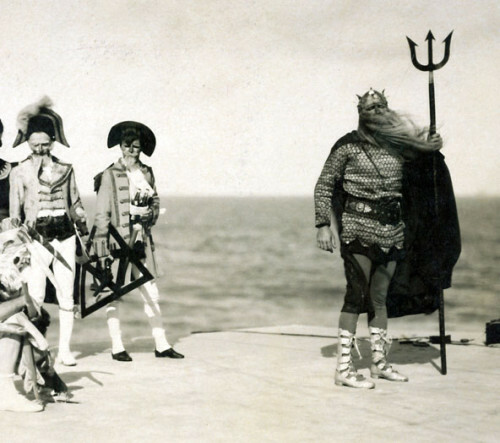 A high-ranking sailor masquerades as King Neptune, and other veteran Shellbacks dress as Her Highness Amphitrite, a royal Baby, Davy Jones, a royal barber, and other courtly personalities. The Pollywogs are forced to endure a number of messy, embarrassing, and often painful, ordeals. A common tradition involves kissing the royal baby’s belly, which is usually covered in grease or some other messy substance. There are also beauty pageants, haircuts, shaving and ducking, and a gauntlet of fire hoses. This video of a 1939 line-crossing ceremony gives some idea of the type of shenanigans and chaos involved. [Note the man being taken off in a stretcher around the 3:25 mark.] The number of props and costumes involved in the festivities is truly astonishing. Evidently the rituals were historically quite violent, and men are known to have died from the brutal hazing. Centuries ago, the physical challenges of the initiation were meant to test new sailors and ready them for the sea. Since the 1980s, though, regulations have been enacted to restrict the hazing rituals, and sailors may opt out; the ceremonies have become more about building cohesion and morale. The back of one of the photos in our collection had a letter pasted to it. It seems the Western Costume Co. provided the costumes worn in this 1925 ceremony aboard the USS Tennessee! 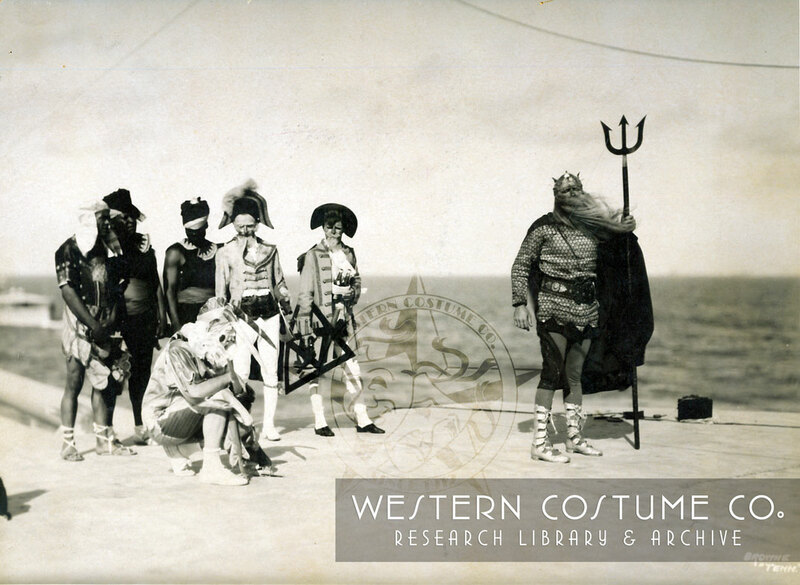 The letter claims, “The success of the Neptune party staged aboard this ship while crossing the equator, enroute to the Antipodes, was largely due to the costuming.” My guess (although I have no proof) is that Western Costume also provided the costumes for the January 1921 line-crossing ceremony of the USS New Mexico, pictured below. Letter to Western Costume Co., thanking them for their help costuming the Line Crossing ceremony.